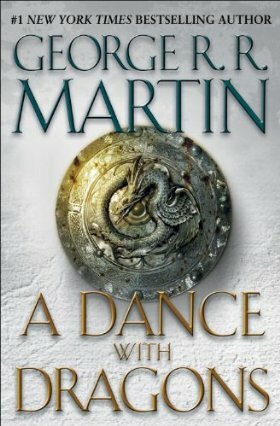 As quite possibly the most talked about fantasy release of 2011, A Dance With Dragons probably needs no introduction. Just in case you somehow haven’t heard of it for some reason, it’s the fifth book in the series A Song of Ice and Fire by George R. R. Martin, which has gained a lot of popularity this year with the airing of the first season of Game of Thrones on HBO. The first four books in the series are as follows: A Game of Thrones, A Clash of Kings, A Storm of Swords, and A Feast for Crows. Two more books are planned, but with the fourth book being split into two, I wouldn’t be surprised if a third book ended up being necessary to complete the rest of the story. There is not yet a release date for The Winds of Winter, the sixth book, which will not even be started until next year. Ever since I discovered it about ten years ago, A Song of Ice and Fire has been my favorite fantasy series, although I can understand that it is not for everyone. This series is certainly not a light, happy read nor a quick read with its sprawling nature and attention to detail. Also, I wouldn’t recommend it to anyone who is offended by graphic violence, sexual content, language or – well, pretty much anything, really. This is a harsh world with some very flawed people. In spite of that, I do think that most of the main cast of characters remain very likable and even those who aren’t necessarily people you’d want to befriend are very compelling to read about. I love the unexpected plot twists, the careful attention to all the little details, the amazing dialogue, the way I can hate a character in one book and then love that same character later, and the sheer brilliance of how it all comes together, but my favorite part of this series is the characters. There is such a wide variety of them, and they’re among the most complex, well-developed characters in epic fantasy. In my opinion, this is the very best multi-volume epic fantasy series there is, and A Dance With Dragons just reinforced my opinion on this after some disappointment with the previous volume. There will be big, bad spoilers for the previous four books in the series from this point forward. If you’re someone who has read the previous four books but doesn’t want to know ANYTHING at all about A Dance With Dragons right now, you’ll also want to avoid this review. A Dance With Dragons runs parallel with events in A Feast for Crows for a while, then continues both stories toward the end. Most of the focus throughout this particular volume is on Jon, Daenerys, and Tyrion, but there are also a few new faces as well as old favorites. The majority of the point of view chapters are dedicated to these three and most other characters only get a few chapters with the exception of Theon. To my great surprise, Theon’s chapters were actually the ones I enjoyed the most in this installment. He’s not a character I’ve ever been particularly fond of, but he’s an observer for some of the more interesting events in the North and he goes through some rather interesting personal developments in this book. I never thought I’d see the day, but I actually felt a lot of sympathy for him (not that I should be surprised after the introduction of his perspective in A Storm of Swords made Jaime Lannister of all people one of my favorite characters in the series!). Aside from Theon, I thought interesting events happened to each and every character, although there were a couple of them with fewer chapters I thought we could have done without. These would be the one Dorne chapter and Quentyn’s chapters. While the last Quentyn chapter was fantastic, the ones before it were a bit dull and that final chapter probably could have been told via another perspective without losing much. Davos was one of my favorites in this one as well, but any perspective dealing with Manderly and events in the North was rather riveting. As for the main three in this book, I enjoyed them all but was surprised that I didn’t enjoy Tyrion’s chapters as much as usual until close to the end. After he learned the truth about Tysha and murdered his father, he’s not quite been himself. He’s been drinking a lot and more passive than normal, and while it was humorous the first couple of times he asked “Where do whores go?” it started to get annoying after a while. Such behavior is pretty understandable given the circumstances, but I was glad to see him starting to act more like himself later. Jon Snow continues to struggle with being Lord Commander and how much he can do while still remaining an impartial brother of the Night’s Watch. Likewise, Daenerys is adjusting to her leadership role in Mereen where she freed the slaves. Her attempts to create a society based on her ideals are admirable, but she still has a lot to learn, and she’s also facing a new problem – her dragons are growing and becoming harder to control. What began as the occasional snack on local livestock progressed to one of them consuming a child, and Daenerys can’t have that as a compassionate person who highly values human life. Prophecies were fulfilled or in the process of being fulfilled! Bran finally got to the North and met the Three-Eyed Crow! Things of consequence are happening in the North, including some awesome vengeance for the Red Wedding! A new “King of the North” is being searched for! Another new king coming from outside Westeros is a contender for its throne! We learned more about Melisande’s powers and Ser Barristan Selmy and got to be completely amused by Victarion and his two gods! Arya is moving on to the next level of her trip to assassin-hood! Cersei was punished! (I have to say I actually felt rather badly for her, though, even though I’ve never had any sympathy for her before ever.) Ser Jorah’s back! Oh, and that banker who keeps popping up and being like, “The person I’m looking for is in the middle of waging warfare? Whatever, I’m there!” is awesome. A Feast for Crows and A Dance With Dragons are basically bridge books in the series. Initially, George R. R. Martin had planned to skip over 5 years between the end of A Storm of Swords and the next book. He ended up deciding this wasn’t going to work very well, and after reading A Dance With Dragons I’m glad he didn’t go this route. While A Feast for Crows still remains the weakest book in the series, I loved A Dance With Dragons about as much as the first two books and I think the series would have suffered if it had skipped over most of these. A lot of it would have had to have been told through flashbacks and it may have been confusing to meet up with the characters again later because these are not people who remain stagnant from book to book. They develop and grow and we would have had to get to know them all over again. Also, while slower paced than the first three books, I felt definite progress was made toward an end and that it’s ramping up for a definite conclusion. We saw prophecies being fulfilled and did get to see some events we’d been waiting for happen. With how this book ended, the next book should take right off. All the hints and clues we are given are brilliantly executed. There’s so many cases where it seems as though there could be one explanation, but there’s another one that makes about as much sense so with each book one needs to carefully examine so many little details. I love how there are so many possible scenarios and how it does reward paying attention to try to fit all the puzzle pieces together. There were so many of these tantalizing clues given in this particular volume and I can’t wait to see more of how they all come together. This book is much more expansive than the previous volumes. While there are still parts that take place in Westeros, we also get to see a lot more of different parts of the world aside from there. The characters are spread out more so for those who loved watching various characters interact, this particular aspect is missing. Personally, I loved seeing more of the world, although I could understand feeling a sense of loss with everyone spread so far apart – but I suspect more of them will be coming together soon in the near future. Although I do think this is an outstanding book, especially when taking into consideration that it is essentially a setup book, it isn’t perfect. It did show that it was rushed since there were a number of typos and missing quotation marks, some of which were quite distracting. It did also start off slowly for the first few chapters, even though in general I didn’t mind that it wasn’t terribly fast-paced. Due to the size, some of the end was cut off as well, meaning there were some DIRE and EVIL cliffhangers. Other than the fourth book, the first three books did leave me curious about what happened next without really feeling like it was leaving me hanging. On the other hand, I have actually been having quite a bit of fun thinking about just how the major cliffhanger will be resolved, so once I got over my first rant (consisting of lots of cries of “Nooooooooooooo! Don’t do this to me, George, you evil man!”) I ended up not minding it as much as I’d expected. I think we’ve been given enough clues to at least get a general idea of what will happen. Some may not think it worth the six year wait, but I did because I enjoyed reading about the characters, seeing more of the world, and keeping an eye out for little details to obsessively speculate about. I thought it was much better quality than A Feast for Crows and had more progress toward setting up the final books. A Storm of Swords is still the best book in this series, but I liked this as much as the first two books. I think readers who are reading the series for the characters and the mysteries, the brilliant setup and dialogue as opposed to the plot twists will enjoy it (although there are a few of those, too, but we may be a bit spoiled in the fast-paced plot department after the number of jaw-dropping events in the third book). It was very well-written with memorable scenes, lines, and characters. I absolutely loved it and while it may not be the best-executed book I’ve read this year, it’s still pretty close considering it’s half a middle volume. It’s the book I got the most personal enjoyment out of reading due to my proclivity toward books about the people in them and a slow-build up of hints and mysteries. Where I got my reading copy: I bought it… and then waited in line for hours and hours to get it signed. Note: I’m just adding a little note here to warn that some of the comments made below discussing the book are VERY spoilery. Read at your own risk if you have not yet read A Dance With Dragons!